Is Getting a Flu Shot Your Only Option? This post is a collaborative effort of homemademommy.net and seasonshealth.com. I just received the latest monthly email newsletter from my daughter’s (former) pediatrician’s office with a ‘flu season update’. The whole newsletter urges parents to get the flu vaccine in their office. They go on to say that they are almost out of ‘preservative free’ vaccines but that the risks of getting the flu this season were high enough that they recommend parents get their children vaccinated with the vaccine containing preservatives. Last month, in a step tantamount to heresy in the public health world, scientists at the Center for Infectious Disease Research and Policy at the University of Minnesota released a report saying that influenza vaccinations provide only modest protection for healthy young and middle-age adults, and little if any protection for those 65 and older, who are most likely to succumb to the illness or its complications. Moreover, the report’s authors concluded, federal vaccination recommendations, which have expanded in recent years, are based on inadequate evidence and poorly executed studies. As I have said before, all these kinds of newsletters do is breed fear and loss of control. If the only ways to prevent the flu are to get a shot full of preservatives and to live in a proverbial bubble, then we are in a sorry state of affairs. This is what I was told year after year due to my asthma. My doctor always recommended (well more like strongly insisted) that I get a flu shot and always made me feel as if I was going to die if I got the flu because I had asthma. Most years, I was told there was not enough vaccine for everyone but that I would receive one as top priority because I had asthma. And I did end up in the hospital for four days once with pneumonia so I took these recommendations very seriously. But a year and a half ago, I started eating real food and building my immune system from the inside out. I have since reversed my asthma and have not had symptoms or had to take any western medicine in over a year. I now believe we can be more empowered to not dread these winter cold and flu seasons. We can help ourselves with proper diet and supplements to ensure our bodies are not breeding grounds for viruses. This helps to avoid getting sick in the first place or to diminish the length and severity of illness we do end up getting. This year I have finally been able to come in contact with someone who was sick and not actually get sick myself. This is a gigantic feat in my book as I used to get sick at the drop of a hat. 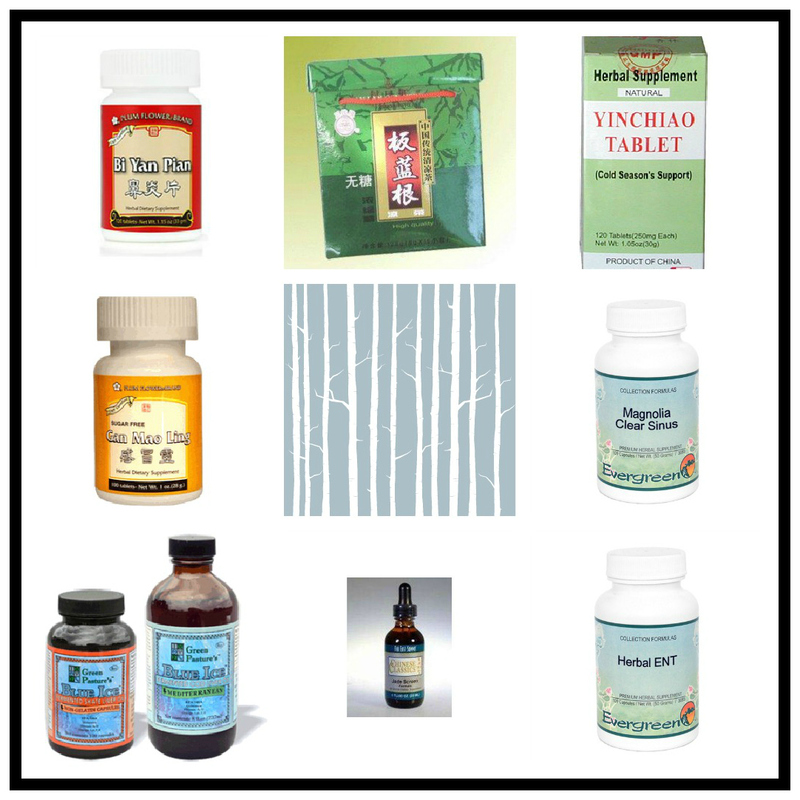 We employ a whole foods based supplement approach as well as incorporating Traditional Chinese Medicine for its anti-viral support and also management of symptoms. Below is a list of herbs and supplements I use to help myself and my family to stay well and to get well quickly when we do get sick. It is important to remember that having a skilled and qualified practitioner prescribe and guide you through use of these herbs is required. My excellent acupuncturist and diet and nutrition expert, Charlotte Sobeck, collaborated with me on this post and she notes that the TCM herbs below are powerful medicine. Some of these herbs are ‘dispersing’, meaning they release the heat, toxin, and viral pathogens out of your body, often thru promoting sweating — you must keep warm, bundled and protect your pores when they are in this process or you can make the pathogen worse. Also any of these remedies taken for long periods of time without guidance could clear too much and leave someone feeling depleted. They are medicine. I know just how powerful they are in that they have helped me to get over my seasonal allergies including cedar fever and they have enabled my husband and I to finally avoid our seasonal sinus infection treatments with antibiotics – in fact, we never get sinus infections at all anymore. Cod liver oil (where to buy cod liver oil) is liquid gold and has so many benefitsincluding being rich in vitamins A and D which have been proven time and again to support a healthy immune system. Fish oil may be high in omega-3s but for A and D, generic fish oil can’t hold a candle to cod liver oil. How many of your parents or grandparents took this as a child? Their generation and all the generations before them were on to something. I take the capsules and give my daughter the liquid variety every day. Ba Lan Gen is a heat clearing detoxifying herb, it can be mixed with other herbs to make a formula to treat viruses with fever, sore throat, swollen glands etc. It has anti-viral properties and can be used to prevent virus on occasion. One must be careful not to overuse. Gan Mao Ling is for viruses with sore throat, swollen glands, fever and chills, sinuses, or swollen lymph. This formula is often used to prevent colds and influenzas when an exposure has taken place. It can be useful also when Yin Qiao (below) doesn’t work. Also useful as a preventative when traveling on airlines or other places where there may be shared air supplies. Yin Qiao is a milder formula with herbs that clear heat for the beginning stages of common cold and flu with sore throat, fever, slight or no chills, HA, cough. This formula is for infection and inflammation in the upper parts of the body including the ears, nose and throat (ENT). It has an antibiotic effect to treat infection, anti-inflammatory effect to reduce swelling and relieve pain and an antipyretic effect to reduce fever. Great for any ear, nose or throat infections. This formula also includes Ban Lan Gen, along with other herbs that clear heat toxin like Huang Lian, Huang Qin and Lian Qiao. Magnolia Clear Sinus contains the herb Xin Yi Hua (magnolia) which unblocks nasal congestion and relieves allergy symptoms of sneezing, nasal discharge, sinus pain and headaches. This herb is great for winter and spring seasonal allergies. This herb truly amazes me, I can be fully congested and I take this and voila – no more congestion in my sinuses. I have no idea how it works but it works! A more potent sinus clearing formula for impacted sinuses with purulent yellow mucous, pain and sinus infections. This formula includes the sinus clearing magnolia herb as well, but adds other herbs like Bai Zhi, Cang Er Zi, etc. which make it stronger along with herbs that will clear the toxic heat of an infection like Shi Gao and Huang Qin. The most important aspect to all of this is building up a strong immune system by eating immune boosting real food (probiotic fermented foods are a must!) and doing some gut healing. From A TCM standpoint, the Jade Screen formula is also a popular immune booster in the winter months. For a daily preventative, of course try this No Flu Tea recipe as well. I hope all of you stay well this winter! Want to keep your kids off drugs? A growing number of health practitioners view with great concern the recent proliferation of medications targeted at kids. The longest night of the year is tonight, December 21st, beginning our journey into Winter. Today is a good time to reflect upon the darkness and the amazing things that happen in the night, and then how we can bring light into our being in the New Year. Winter is often a challenging time for our immune and respiratory systems. To stay healthy and vital through the winter months it is important to support and strengthen our body’s natural defense mechanism, the immune system. When the immune system is strong, the body is better prepared to handle the ever changing Texas weather, stress, and the unavoidable pressures of daily life. Probiotics can safeguard your health this winter, keep your digestion working, eliminate harmful microbes from your body protecting it from dangerous bacteria and viruses. They can also heal your intestines from antibiotics and greatly enhance your immune system, helping you avoid seasonal allergies and asthma. Not any probiotic will do, visit me for the probiotic best matched for your constitutional need and a wealth of other comprehensive care and products available. Chinese medicine believes that wind invasion can weaken your body and make catching a cold more likely, so protect your body from the wind by donning a scarf, hat and underclothes on your body and your child’s when outdoors this winter, keep your feet warm and dry and if they do get wet, and have delicious cod liver oil available to boost your immunity! Remember as you watch the colorful leaves fall conserving the tree’s energy for the cold winter’s months, the roots of the tree are reaching deep into the warm earth for protection so it can continue to thrive and grow all winter long. We are connected to nature and can glean guidance from watching the plants and animals prepare themselves for winter. Little squirrels are gathering nuts with plenty of healthy fat to keep themselves nourished all winter long. Creatures are burrowing down into the warmth of the earth for a winter’s nap. This winter visit your local farmer’s markets and load up on deep root vegetables and dark greens that grow this season to nourish your bodies, drink warm rich homemade broths, get plenty of rest, keep warm and cozy and have a prosperous New Year full of all things that bring you and yours joy and that priceless feeling of good health.